Click the button below to add the ME-PT-100 MAGNUM MPPT Charge Controller, 100A, 12/24/48Vdc to your wish list. 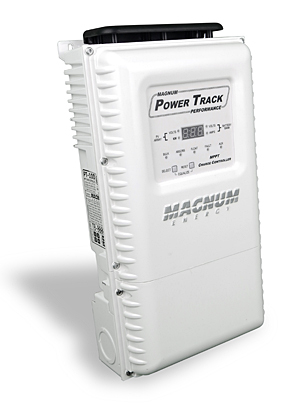 The PT-100 is a high voltage, high amperage controller that can be programmed with simple DIP switch settings, or one or more units can be controlled through your Magnum remote control for more advanced programming (ME-ARC or ME-RTR). It can actually take an array size of up to 6,600 watts (STC) at 48 volts, which is twenty-four 275 panels in six strings of 4. The PT-100 has the great feature of limiting the output current to 100 amps, which means the output won’t exceed 100 amps even if you oversize the array. With simple menu functions and displays, the PT-100 is a very intuitive charge controller that is designed to be mounted on the Magnum MP or MMP platform. It's UL-1741 listed and easily stackable up to seven units (700 amps!). While stacked, they maintain coordinated battery charging profiles to avoid all the issues of multi-controller charging conflicts. Has auxiliary dry contacts for relay controls. Has two internal fans for cooling. The software can be updated in the field.